ISR is always reaching further to bring you the finest underground sample and preset packs for your music productions, so we are extremely proud to broaden our scope and present our first primer collection of Effects and Cinematic kits especially made for the modern cinematic producer. 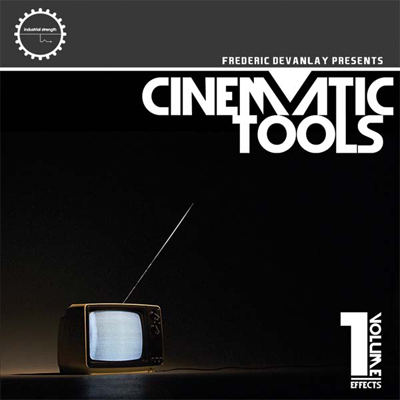 Cinematic Tools is a pristine effect collection and was produced by non other then Fred Devanlay. Fred has been a composer and sound designer for 18 years, he has co produced and engineered for French Dj's Claude Monner, Erik Rug and Martin Solveig. Fred created Big Wheels Studio in 1990 and started rocking the video game and film industry. He has worked on many AAA games with U.S. composers Tom Salta, Cris Velasco, Sascha Dikiciyan. Fred was also nominated several times for the (BAFTA, GANG awards) as “Sound Designer of the year”. In this first collection Fred provided the essential one shot effect samples you need to really beef up any break down or build up in music or films. The effects are great for layering so you can create your own personal touch to each sound. This pack is outstanding for any electronic music style. The pack includes great drum loops, glitched out effects, and music loops all keyed and labeled with the tempo for ease of use when searching for the right sound. Cinematic Tools contains Explosions Risers, Pass-bys,, Reverse effects, Sweeps, Impacts, Dives and truly ear grabbing audio loops that are fantastic for any film or music production. The pack also contains 5 Cinematic Kits which contain Main Cues and feature broken down layers so you can produce your own cinematic music with not much effort. Cinematic Tools is geared for a the pro user and the beginner alike. All the loops in this pack are in Rex.2, Acid and Apple loops. Cinematic Tools also features Kontakt and Battery kits for you Native Instruments users. All the audio contained in the pack is at 44.khz 24 Bit. If your in search of a great effect pack for Cinematic, Video game, or Music production then Fred Devanlay's new Cinematic Tools collection should be your first destination. CLICK HERE for more info. on Fred Devanlay.